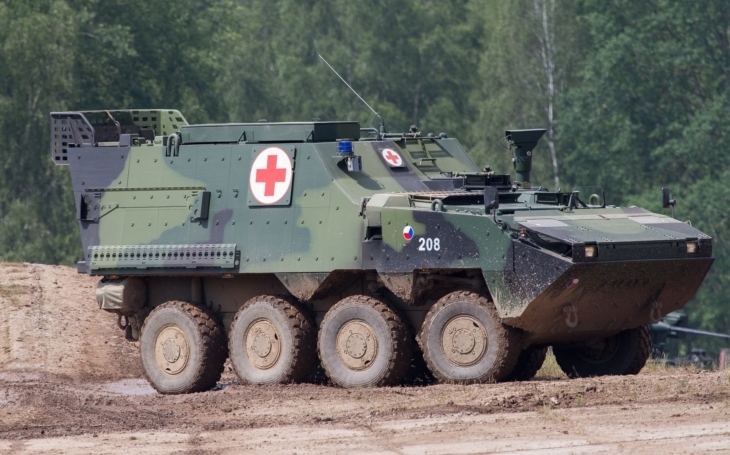 Chapter 6 of the General Staff’s „Modernization Projects of the Czech Army“ document deals with intended upgrades for the 107 currently operated wheeled Infantry Fighting Vehicles (IFV), the Pandur II 8x8 CZ, which is an improved modular version of the Pandur 6x6 Armoured Personnel Carrier (APC), produced by the Austrian Steyr-Daimler-Puch Spezialfahrzeug GmbH, subsidiary to General Dynamics’ European Land Combat Systems (GDELS). The selection process, purchase and commission of this vehicle, which is now one of the iconic vehicles of the modern Czech Army, into the Czech service is a very long story and offers unanswered questions until today. The Government initially agreed with the purchase of 199 wheeled APCs in 2003, in 2005 the project included an option for 35 additional vehicles for a total of 234, and had a potential value of CZK 23.6 billion (approx USD 1.2 billion at contemporary rates). Steyr won the tender in 2006, under the Government of Jiří Paroubek (ČSSD), but in 2007 the Government (led by Mirek Topolánek, ODS) withdrew from the contract, officially stating that Steyr had failed to keep the contract conditions. After long negotiations, the Government agreed on purchase of 107 vehicles at CZK 14.4 billion (approx USD 692 million at contemporary rates) in spring 2009. In 2016 Marek Dalik, adviser to former Prime Minister Mirek Topolanek (2006–2007 and 2007–2009), was sentenced to five years in prison and a five-million-crown penalty for fraud in relation to the purchase of Pandur vehicles. According to Stephan Szcuecs, former employee of Steyr, Dalik pesonally demanded 18 million Euros bribe to ensure the continuation of the purchase project. The price the Czech Republic payed for one vehicle was approximately triple when compared to the price payed by the Portuguese Army. 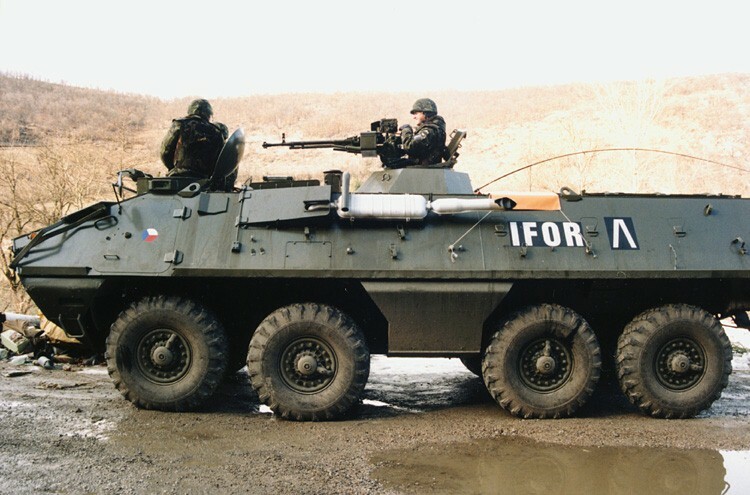 The Czech vehicles are all amphibious, except for the M1 RVS variant with better armour protection (see bellow). The Pandur II was to replace the obsolete Soviet-era OT-64 APC, which is a Czechoslovak/Polish variant of the Soviet BTR-60. OT-64 is a wheeled amphibious personnel carrier, combat and transport vehicle used in mechanised, signal and special units. It was constructed in 1959 and introduced into the Czechoslovak People's Army in 1964. The carrier has been in use in many versions in terms of its weapons and additional equipment. The Pandur II vehicles are operated by the 4th Rapid Deployment Brigade’s 41st and 42nd Mechanized Battalions. In January 2017 purchase of another 20 Pandur II vehicles from Tatra Defence Vehicle (member of the Czechoslovak Group, CSG) for CZK 2.1 billion crowns (USD 82.77 million) was announced. These will be delivered in 2019 and 2020 as 6 KOVVŠ Command Post Vehicles and 14 KOVS Communications Vehicles, rising the total of vehicles operated by the Czech Army to 127. Implementation of elements of mechanical protection of the weapon station. During the NATO Days held in Ostrava in September 2017, the Tatra Defence Vehicle company unveiled a Self-Propelled 120 mm Mortar variant of the Pandur II CZ 8x8 CZ vehicle, developed in response to a new request of the Czech Army for such fire support vehicle which should complete or replace the existing Self-Propelled 120 mm Mortar PRAM S tracked vehicles (operated by the 7th Mechanized Brigade). We will get back to these in a next article.